King was accused of killing one man and injuring another in a deadly sword fight, and escaped from prison in 2016 while waiting for trial. 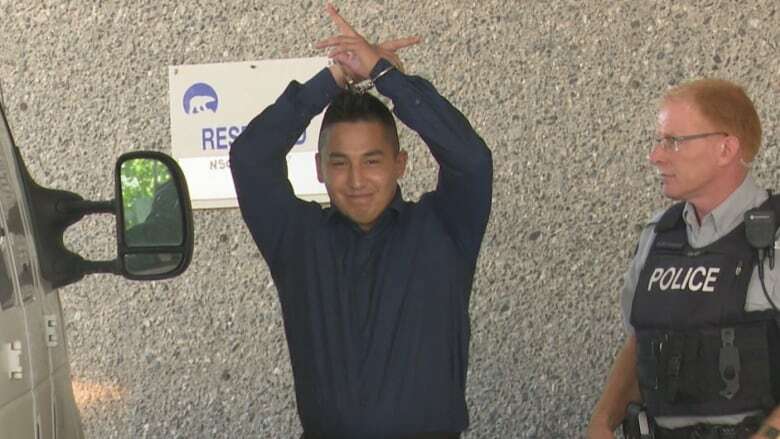 Applause and sobs were heard in a Yellowknife courtroom on Friday as an N.W.T. Supreme Court justice ruled Denecho King is guilty of second-degree murder and aggravated assault. King, 25, was convicted of killing John Wifladt and seriously injuring Colin Digness in a deadly sword attack in Digness's apartment on Dec. 14, 2014. Justice Andrew Mahar delivered his verdict over 45 minutes Friday afternoon. As he finished reading the ruling, a woman rose in the courtroom and yelled, "F--k you, my son is going to get life in prison," while others clapped. Some could be heard saying "thank you" to Mahar. "Whatever happened, happened very quickly," Mahar said in the verdict, calling the injuries sustained by both men "extreme." "I have sympathy for everyone involved in the process," he said. John Wifladt's father Jack Wifladt spoke to CBC News at John's grave a few hours after Mahar delivered the verdict. He showed the locket he wears, with a picture of his son inside. "It's been a very hard and trying day, but we're satisfied with the verdict," he said. "Now we just have to wait for the sentencing to happen. That will be another trying day." "It's something I feel never, ever should have happened. This is the outcome," he said. "We're not the judge and jury. We're the family. It's been very hard on all of us." Mahar noted that the basic facts of the case were not contested by either Crown or defence. Instead, the two sides argued about how Mahar should interpret those facts. Though there were no eyewitnesses to the attack, the prosecution argued forensic evidence and testimony from people who spoke with King after the incident proved his guilt beyond a reasonable doubt. Wifladt and Digness, along with Digness's decorative swords, were found on the floor of Digness's apartment surrounded by blood. A forensic expert testified that a large amount of the DNA found on the handles of the swords belonged to King. King's lawyer, Jay Bran, told CBC News he wouldn't be making any statements until after the sentencing. During the trial, he argued Wifladt and Digness attacked each other in a mock 'Star Wars battle' that went wrong. Bran also argued King's DNA was only on the sword through either Wifladt, Digness or the emergency personnel who attended the scene. Mahar ruled that he considered that scenario, but the amount of DNA and location of it left on the sword handles made that "highly implausible and unlikely." "Given the way the events unfolded, there is a short window of time when which this incident could occur," Mahar said. The verdict came after a four-week trial before Mahar alone. A date has not yet been set for sentencing. Prior to the trial, while in custody on the charges, King also made headlines after escaping the North Slave Correctional Facility.